Steve Harvey's attornery, Bobbie Edmonds, sent out a statement on his behalf to counter the videos that were put out by Mary Harvey this past weekend. 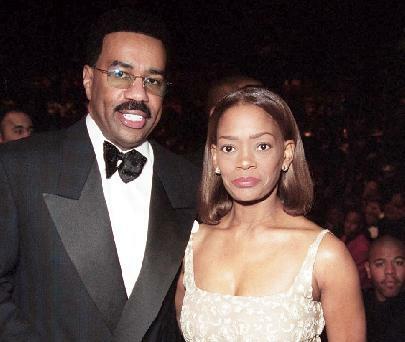 We are appalled and aware of the videos and other fabricated documents, which were placed on the internet over the weekend by the ex-wife of Mr. Steve Harvey, which contained false, misleading, derogatory, disparaging, malicious, explicit and slanderous information about Mr. Harvey, his current wife and others. We are saddened that the ex-wife has resorted to such devious and selfish behavior, with a reckless disregard for their minor son, her adult son and Mr. harvey's other children. The ex-wife is fully aware of the court's current orders and permanent injunctions which prohibit either party, their lawers or representatives from discussing and releasing information on the internet and to the media. We are taking the necessary legal steps to rectify this matter to the full extent of the law, and we will be seeking contempt and sanctions against her for such reprehensible and callous disregard for the court orders. Mr. Harvey cannot personally respond to these assertions, documents and videos due to the existing court gag orders.